How do we know that the 66 books in our Bibles were all inspired? The word canon means a standard or measuring rod. The canon of Scripture means those writings that are inspired. Some Bible writers stated explicitly: “This is the word of the LORD” or “This is what the LORD says …” (for example: Jeremiah 2:1; Joel 1:1). Other books do not claim to be inspired, but they quickly became recognized as inspired because the person who wrote them was accepted as a prophet of God (for example: Genesis, Song of Solomon). he should not teach people to turn away from God (Deuteronomy 13:1-5). The Old Testament was well established by the time of Jesus. The books had been accepted for centuries for being recorded by prophets of God like Moses, Isaiah and Ezekiel. These men had visions from God and made prophecies that came true. Therefore what they said and what they wrote were accepted as the work of God. The Hebrew people looked on the Old Testament books as sacred Scriptures from the very time they were written. 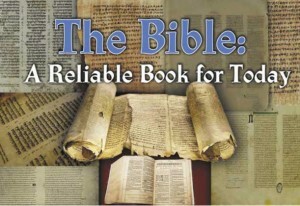 It did not take long for the New Testament writings to be considered scripture also. For example, the letters of Paul were considered Scripture by the time Peter wrote his second letter (2 Peter 3:15-16). The most authoritative evidence for the inspiration of the Old Testament canon comes from the words of the Lord Jesus. He recognised the Hebrew Scriptures as the inspired Word of God. “To whom the word of God came (and the Scripture cannot be broken)” (John 10:35). After his resurrection, he appeared to his disciples to tell them how everything written about him in the Law of Moses, the Prophets and the Psalms must be fulfilled (Luke 24:44. His direct reference to the three sections of the Hebrew Old Testament canon that were in existence at that time is authoritative evidence that Christ himself knew, respected and used the Old Testament. Apostolic authority was the chief test to determine genuine New Testament Scripture. Men who had lived with Christ and who had seen him and talked with him following his resurrection had unique authority and power. Members of the early ecclesias could recognise which books were genuinely apostolic. The books were either written by an apostle or by someone (such as Mark or Luke) who were companions of the apostles. We trust in Christ’s promise to his apostles, “The Spirit of truth will guide you into all truth” (John 16:13). When Christ promised the apostles that they would be guided by the Holy Spirit into all truth, he indirectly put his stamp of approval on the writings of the New Testament that the apostles would go on to produce.